My first work of interactive fiction “Moquette” came 15th out of 35 entries in this year’s IFComp. Now that the competition is over, the vow of silence has been lifted (authors are not allowed to talk about their games publicly during the judging period), which means I can now write some blog posts talking about the ideas behind the game and how it was built. 15th place is a bit lower than I was hoping for, of course, but given the reviews it was roughly what I was expecting. There were various elements of the game that people were impressed with – but very few people really loved it. The IFComp results page has a good breakdown of the voting statistics, including the standard deviation, which is a measure of how wide the range of votes for each game was. Moquette has the 6th highest standard deviation, so was one of the more divisive games in this year’s competition. That’s quite a range, with votes across the whole spectrum but mostly falling within the region of “not terrible, but not great”. I deliberately set out to do something different with Moquette, so perhaps a wide range of reactions is not surprising. From the reviews, it seems people were mostly impressed by the text effects and the simulation of the London Underground. The writing itself got more mixed reviews – some people liked the style, others thought the plot was too slow or didn’t make sense (or didn’t really exist), and a lot of people didn’t warm to the main character. I suppose this is simply a reflection of my own limitations. The text effects and tube simulation were the easy parts. I’ll go into those in detail in another blog post, but the tube simulation was the first bit I had working and it wasn’t difficult for me to implement. 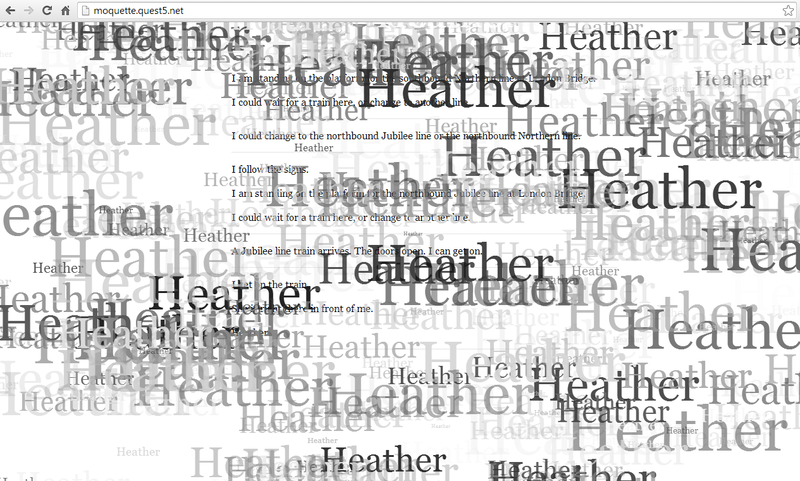 I saved the text effects until last, and there’s not an awful lot to them – a little jQuery goes a long way. The plot was what gave me trouble. I was tearing my hair out for ages trying to work out just what should happen in the game, and how it should end. I just can’t fathom what the secret ingredient is for generating a plot. I don’t have much experience writing static fiction, but from what I gather, at least if you’re just writing words on a page, you can kind of “go with the flow” and see what plops out as you let your fingers walk across the keyboard. How can you do that with interactive fiction, which can’t be created in such a freeform manner? I need to know what I’m building so I can break it down into its constituent parts and implement it – I don’t see how it’s possible to build something interactive the other way around, at least not if it is going to have any kind of strong author-created plot. Or, perhaps it is possible, but only by discarding a lot of work along the way – and it’s difficult to do that if you’re working to a deadline. It turns out that characterisation is also a challenge for me. I thought I’d got around this by basically making Zoran a version of myself – albeit a “me” from about 10 years ago when I was in my early twenties. But reviewers really didn’t like Zoran all that much. I felt conflicting emotions whenever my writing was praised for its portrayal of someone who, as it turns out, is intensely dislikable. In the author’s forum, somebody wrote “The awkward conversation with the failed flame was just executed perfectly to paint a picture of a hateful, disgusting human being wasting his life and self-absorbedly assuming that everyone else is doing the same”. Thanks, but… owch! So, how did Moquette come about, and what was I trying to do with it? Well, I’ve been talking about my vision for the future of text adventures for a long time now – in previous blog posts such as Text adventure games are still new, Thoughts on interactive storytelling and The Hobbit, Experimenting with stories and text, and in my talk at AdventureX. I realised that my thoughts would have a lot more weight if I backed them up by actually trying to create something, instead of just talking in the abstract about the kinds of experimentation that are still to be done with text-based games. So what I tried to create wasn’t simply a technology demo, but to play around with various ideas and theories about how interactive story experiences might be constructed. I will split the experimentation up into five aspects, which I’ll explore in more detail below. Quest started out as a parser-based system, although it has supported a hybrid hyperlink interface for a while now. It also now supports a simpler multiple-choice style of game – gamebook mode, which lets you create Twine-style works. In Moquette, I’m exploring a style of game which is somewhere between the two. It doesn’t have the simple branching structure of a gamebook, but it doesn’t leave things completely open-ended like a parser game would. It is designed to be interacted with like a gamebook though, but underneath it is actually using the parser mode of Quest – I’ve just turned off the command input box and there are no objects with verbs to interact with. I’ve used the power of Quest’s ASL programming language to model the tube network, and handle the passengers which are randomly thrown at you as the game progresses. The result is a game world that can be explored in a similar way to a parser game, but with a simpler interaction model. It’s the kind of game that couldn’t be written with Twine, or printed as a Choose Your Own Adventure book, because the game doesn’t use a branching model (if it did, the branch map would be huge as you can explore the tube network freely – it would have to be a ridiculously large book to handle all the possible combinations of choices). I wanted to show that even with a minimalistic UI, you could create an explorable world, and you could do it more subtly than continually asking binary choice questions like “do you want to speak to the woman, or change to the Northern line?”. In Moquette, choosing one option often doesn’t rule out exploring other options too, and it’s easy to keep track of what you’ve done – the screen doesn’t clear between choices, but irrelevant links are deactivated so you always know exactly what options are available to explore. Despite all the options that are available throughout the game, there is only one real choice – and it’s right at the beginning. Do you let Zoran follow his usual routine and go to work, or do you intervene and try to stop him? Even here it doesn’t really make much difference – the choice you make comes back to you at the end of the game, but there is no real right or wrong answer (in my mind the “winning” move here is actually not to intervene, because that results in Zoran reaching his own conclusion and making his own choice. But, on the other hand, it’s also a winning move to show him the way). Many people worked out that the choice of which tube train to get on was ultimately inconsequential. Some people didn’t like that. They expect to have a choice and to affect the outcome of the story. “You are the hero!” – but you’re not the hero in Moquette. You’re not the protagonist. This is contrary to the assumptions of most interactive fiction, but in writing Moquette, I haven’t really been following the examples of text games I have seen before. I have been much more inspired by interactive theatre – the explorable worlds created by the likes of Punchdrunk and Secret Cinema, and wondering how to adapt those ideas to text-based fiction. I believe that it is possible to create immersive, interesting story experiences where you have no effect on the outcome at all. You don’t win or lose when you experience Punchdrunk’s The Drowned Man, and you can enjoy the experience safe in the knowledge that you can’t get anything “wrong”, and that you will always make it to the ending. Surely text adventures can do this too? One of the things that appeals to me about Punchdrunk is that everybody has a unique experience – there is always far more of the world to explore than you could possibly get around in one performance. I wanted some of that feeling in Moquette too, but without the flaw that often plagues Punchdrunk performances where the plot can be difficult to work out. As a single-player text game, I can adapt and move the world around according to the player’s choices – so you always get the complete plot, but different players will experience it in different locations. I wanted players to think that the encounter with Heather really is random – and that you felt that maybe if you’d gone a different way, something else would have happened instead. I wanted the game to feel bigger than it is, that when passengers got off the train before you’d had a chance to interact with them, that there were unexplored possibilities. Of course, the illusion is shattered as soon as you play the game for a second time, and I expect many players are wise enough to work out the mechanics even when playing once. But hopefully it shows the kind of “magic tricks” that a text game might easily be able to perform. There are no puzzles in Moquette, and you will always finish if you just play it for long enough. But this gave some people a problem – there is no objective. Some people even emailed me plaintively – “what am I supposed to do?”. It’s interesting how that seems to matter, and I’d like to challenge the assumption that there should be an objective in interactive fiction. You don’t expect an objective when reading a book or going to the cinema – or if there is one, it’s simply “experience and understand the story”. Can’t that work for interactive fiction too? I’ve never really liked the second-person style of most interactive fiction. “You are standing in an open field west of a white house” – no, I’m really not. I think writing in the first-person neatly sidesteps a lot of issues – I’m no longer wondering what my role is, how I got here, what my previous memories might be, or what I’m supposed to be feeling. Instead I can simply enjoy seeing the world through somebody else’s eyes. In Moquette we teleport inside Zoran’s brain, and we get to play with some of the controls. But the suggestions we make to Zoran are just that – suggestions, which he doesn’t have to obey. Maybe this aspect of the game isn’t really that experimental – certainly none of the reviewers picked up on it. But given that nobody complained about it, I think the choice of first-person works well and is probably something that should be considered more as a sensible default voice for interactive fiction. There are various screen transitions throughout the game – I liked the idea of it having something of a graphical feel, even though it was only using text. Here are all of the publicly available reviews and mentions I came across (let me know if I’ve missed any and I’ll update the list). I also tried a little to get the word out beyond the normal IF circles. With the game set on the London Underground, it made sense to reach out to London blogs – it got small mentions on Londonist and Diamond Geezer. The competition rule requiring authors not to discuss games publicly hurt a bit here – if we can’t promote our own games (and the competition in general), who will? Who will take responsibility for plugging the IFComp outside of the circles of people who already know about it? This entry was posted in Text Adventures on November 19, 2013 by textadventurescouk. — I am in favor of experimenting more with world-model-rich systems that have more accessible interfaces than standard parser IF. I did find Moquette pretty interesting from that perspective. — First person, while not the default, has been done enough times that I don’t tend to think of it as experimental in itself. Maybe other people thought the same. It’s kind of in this intermediate space where it hasn’t become the Accepted Way Everything Is Done, but it’s not a black swan either. — Re “It’s not a game” — I am totally fine with puzzleless games or interactive stories that don’t have many game qualities, but I did feel somewhat goalless in the middle of Moquette because I reached a point where I seemed to be making no further progress and didn’t know what I could do in order to advance things further. The answer in practice was “keep riding around on these trains until some sort of timing trigger is reached”, but I didn’t know that and started to worry that I was missing something. Because of the nature of the story, after a while I started to wonder if maybe that was even sort of the point, in some grand meta way — something about rejecting the laborious goal-direction of paid work — and that I was supposed to ride the rails until I got bored and then quit. Fortunately I did trigger more events soon enough after I started thinking these thoughts that I didn’t quit. But that’s where they came from. — As for Zoran, I think you set yourself a hard problem precisely because of the low-agency, lonely story you wanted to tell. It’s easier to make a character likable if you put them in a situation where they can be shown having some ongoing goals (before the story starts) and making important or positive decisions (during the story). This doesn’t have to be the proverbial script-fix where you show your hero rescuing a cat in scene 1 so the audience knows they’re supposed to like him — but if pretty much their entire exposure to the player consists of unhappy inner monologues, it’s hard to avoid giving the sensation that this character is whiny but ineffective. In this sense, plot and character are not unrelated — the plot gives us opportunities to illuminate the character. It also helps if you can show them having some friends or family or other key relationships in their lives. Zoran’s only contact here is this woman he really doesn’t know at all. …well, you can do that, yeah. It always doesn’t guarantee great results, though. The thing that’s been most useful for me here, aside from reading various books about plotting for static fiction, has been playing a bunch of tabletop storygames. Many of these have mechanics for generating plot complications on the fly. Yes, absolutely. There’s been some talk about IF as interactive (particularly historical) diorama, rather than hero-driven plot; and I can definitely see the commonality between this and interactive theatre (I’ve talked about this with other interactive-theatre enthusiasts, in fact, though I haven’t seen any events myself). If that’s what you’re aiming for, though, I think that requires a rather more rich and vareigated world – you’re shifting all the weight of the game onto exploration, so the player’s going to want stuff to find. In Moquette the main Thing To Look At – the other passengers – get delivered to you in a conspicuously random way, so there’s little motivation to go looking around. I think that the rule is ‘give the player something interesting to do.’ That thing doesn’t have to involve driving the central events of the plot (although that’s the most straightforward way to do it). But that thing should at least be compelling enough to avoid the Varkana problem. (1893: A World’s Fair Mystery and The Fire Tower are close to this, I think; in both, it’d be fine if someone else was driving the through-plot, because the player has plenty to occupy them that doesn’t directly influence the through-plot. I wanted to comment on the business of “how do you write a plot when you have to break it down first”? I think that’s really important — absolutely key, in fact. Pen and paper affords writing, because you can jump all over the place, annotate, correct, re-file, tear bits out so it’s easy to be crazily creative — but hard to nail down the detail — and that’s perfect for banging out ideas. Writing straight into a word processor, where the more you jump around the more lost you become, but it’s easy to obsess over the detail of a paragraph, is IMO much more difficult. So with interactive fiction, I think it’s all about good tools that afford “fast and wobbly” generation of content, with an eye to fixing it properly later. Implementation should be rough and ready. That’s, I think, why I’ve always found Inform 6 easier to write in than Inform 7; it’s faster, more scrappy, and more easily bashed around. So, like, it’s about good tools, but a good tool needs to produce nice output and sit nicely in a human being’s hand. 1. I tried very hard to get to Mornington Crescent. I was bitterly disappointed that it wouldn’t let me get there. 2. I then suddenly realized the meta-irony of #1, and found that rather funny. Assuming you’re familiar with that game I’m referring to, I think it would have been much better if you came up with random funny reasons denying the player’s progress in the direction or Mornington Crescent. But I’m glad I stuck it out: As it was, I was one of the voters who gave it a “9”. I just sort of “got” it. For what it was attempting to be, I just found it extremely good.